Was Sherlock Holmes inadvertently responsible for the results of the election on November 8, 2016? 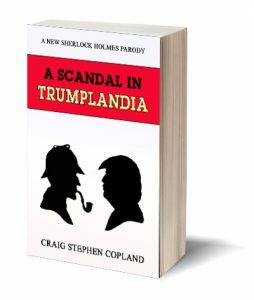 This light-hearted parody (Note: NOT a New Sherlock Holmes mystery) reveals the secret meeting held between Sherlock Holmes and the GOP candidate for President of the United States. A devastating old film clip, made fifty years ago, if it is released, will completely destroy the campaign of The D—. Only Sherlock Holmes can save him from self-destruction. But will he want to? And, if so, will he be successful? The story is a parody of the much-loved original story, A Scandal in Bohemia, with the character of the King of Bohemia replaced by you-know-who. If you enjoy both political satire and Sherlock Holmes, you will get a chuckle out of this new story.